If you have not seen this post about Smartsteem, you are definitely not using Steemit.com to the fullest for your blogging potential. Read more below from an article I wrote previously on Steemit. I have started using services by smartsteem and overall very satisfied. 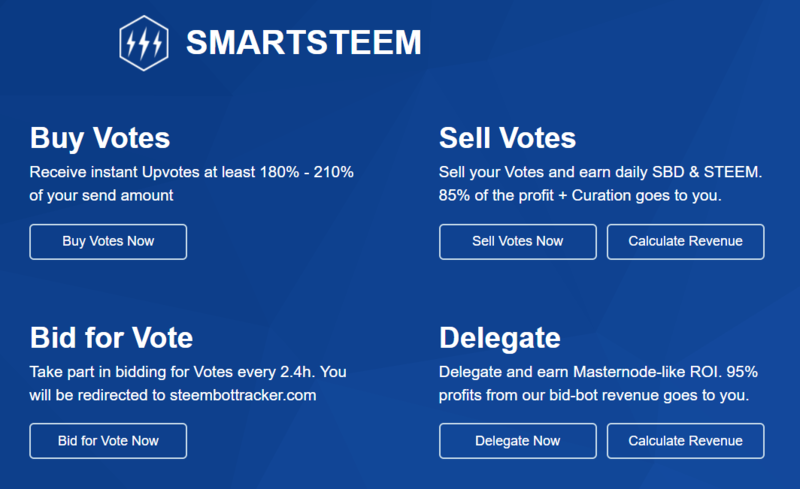 Smartsteem provides 4 main services which I think are useful for everyone in the Steemit community. To gain more visibility for your posts, buying votes can be quite beneficial. Simply send 0.100 - 1 SBD to @smartmarket with your post's URL to get it upvoted. You might be thinking why spend money upvoting your own post? Firstly, it helps give your post more visibility. You want more people to see your posts and the value your post is, the more likely someone will notice it. You may not have noticed, but people who are selling their upvotes to vote your article will notice your article too. If your post has an interesting title, they might actually read it and start following you. Secondly, you get 1.8x - 2.1x the author rewards than just keeping your SBD in your wallet. I have personally seen this guaranteed return although the actual value may drop due to SBD price and the rewards pool size at the end of 7 days (read my previous post for more information on the rewards pool in the STEEM bluepaper). 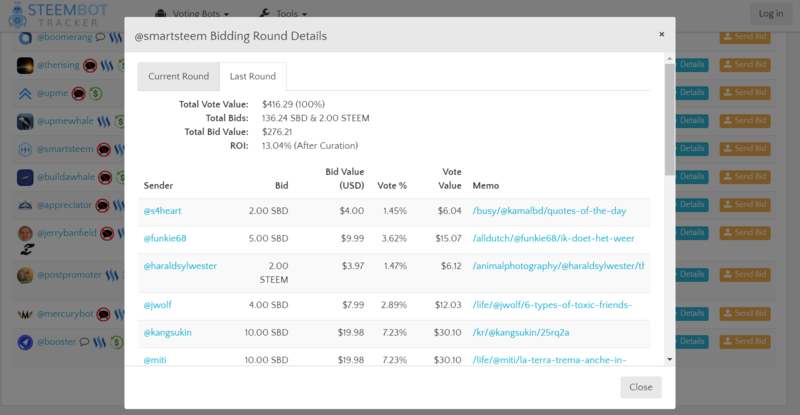 An alternative way to get upvotes is to bid for upvotes that are given out every 2.4 hours based on the @smartsteem bid-bot. Send 2.0 or more STEEM/SBD to @smartsteem to get a fraction of the upvote given out in the next 2.4 hours. Use steembottracker.com to check how many voters are there currently voting. Selling votes is a MUST. Because we are never physically here upvoting when our voting power reaches 100%. Yikes! Use the auto upvote services of smartsteem to make sure that you continue to earn curation rewards when you are on vacation or sleeping at night. I currently know @minnowbooster and @smartsteem to be the only places where you can delegate your Steem Power. 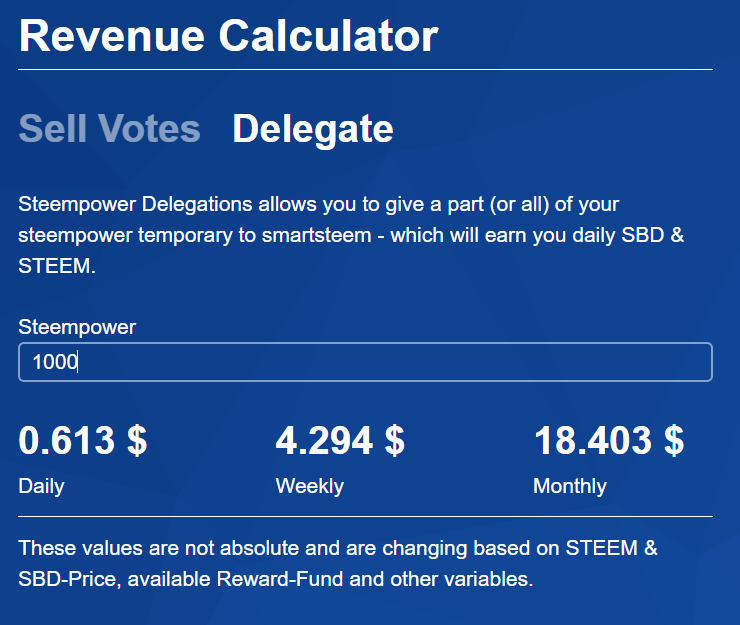 It is a good way to help the Steemit community by delegating some of your SP out to @smartsteem as up to 95% of their profits come back returned to you. As a delegator, I am proud to be part of @smartsteem community. I am currently on the waiting list to be whitelisted fingers-crossed by @smartsteem as they are providing author reviews that produce quality content. I don't think I will get a 3-star rating, but would be honoured to get whitelisted. Being on the whitelist also allows the smartsteem bot to recognize you as an original content creator and not a spammer / listed on their blacklist. I really appreciate their team of reviewers doing us this service. If you have not signed up on smartsteem, please do so by clicking on the banner. While I thank you now for letting me become your referrer, you can thank me later after using smartsteem services. Good luck! Donate as you wish, I will continue to write more content with your support, thanks! Of course, since my blog is about Crypto Mining, let me present my case why it is a good investment for cryptocurrencies. For starters of cryptocurrencies, you will need a digital wallet. It can be a physical wallet in the form of a USB drive or private key information that you can also store on a PC. Another way is to have an online wallet. We are already used to the concept of digital online wallets. Google, Facebook, Apple. They have wallets where you can store some cash online for purchases. I was particularly intrigued by the idea of cloud mining and people selling their hash power to buyers. Coin mining is the computationally intensive work Proof-of-Work (PoW) that needs to be done for every coin transaction. It is a mini-audit process to verify that the transaction is real before it gets added to the ledger aka blockchain. Transaction verification is done by miners who run these algorithms using high computation resources (ASICs or GPU) and when gets paid for each successful check. Pool mining means you will become a coin miner. Buy your GPU and hardware. Run the programs. Get the coins. Join other miners in a 'pool' and share the benefits of constantly getting coins paid by doing your share of mining. In solo mining, you have to fight with supercomputers to find the solution in the PoW algorithm. When you find it, you gain all the coin for finding the block of solution. Chance of finding a block of solution? Very low. So rather than waiting to win the lottery every 5 years, I prefer to join a pool mining where I get paid like a regular worker for the amount of work I have done. Sounds fair and democratic. This blog allows me to share with you ALL the tips to build a profitable mining rig. Are you ready to learn something new? We have to do cost-profit spreadsheets, sourcing for affordable hardware, assembly of mining rig/ computer components, run benchmarks, etc. It is highly technical, but these skills you cannot unlearn and will be useful in the future. The other above options are not my best choice but I have given you choices, and decisions are waiting to be made. Banks are struggling with the latest technology implementation - Blockchain. The power of blockchain. Auditing in finance has never been so advanced and of course, we have the best bookkeeping practices now! I first heard of the technology, now my both hands are in. Instead of becoming a cryptocurrency trader, I am inherently more interested in harvesting the cryptocurrency blockchain mining technology. Learning how to mine cryptocurrencies and how to make it profitable.